Finally back to scrapbooking! It's been a long time coming. Right after we moved into our house, I ordered over 100 pictures from our spring and summer adventures. I have lots of backlog from years of time off, but I decided to start with current and fill in when & where I can. 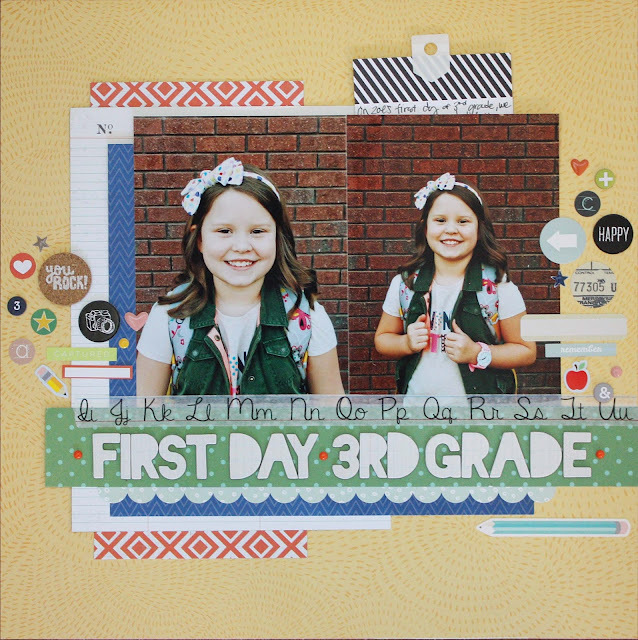 What better way to start then scrapbooking the first day of school. Zoe's first day of school this year was unique. I hope and pray that this is the only year we start school living in a hotel. Yes these picture were taken outside the front of our hotel with lots of people walking in and out. The story isn't my favorite, in fact after I dropped her off, I cried. I cried because I missed Texas, I wanted her to have a "normal" first day and I cried because I thought that her starting school would make everything normal, but it didn't. Despite my own feelings and insecurities, Zoe had a great day! She came home regaling me with all the names of her new friends and showing me her new planner. Since this particular story involved my own tale of ugly crying, I didn't really want the journaling front and center. I used a 3x4 journaling card and a plastic tab to hide the story. Some stories are harder than others to tell. This one was hard for me. It was a reminder of those frustrating feelings I felt as a mother. 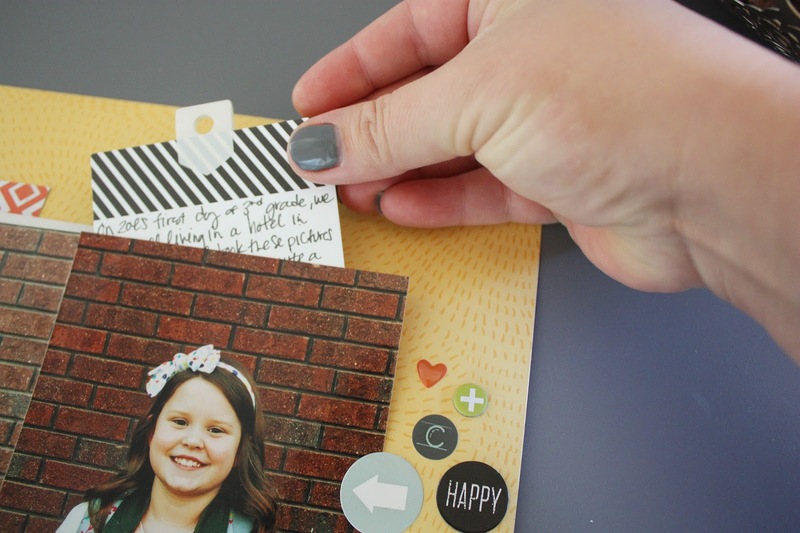 All my worry and stress rolled into one scrapbook page. But, it was important for me to write down my true feelings because one day Zoe will read those words, maybe in a year, maybe in a few years, and maybe when she has children of her own. When she reads those words she will see how much I cared, how much I worried, and how everything turned out okay. This story is more than just pictures of the first day of school, and that's just one of the reasons I love scrapbooking so much. Where do you write down your stories? A journal, scrapbook pages, twitter?